The Lifestyle Hub: Vilma Santos amused on her first blogcon for "The Healing"
Vilma Santos amused on her first blogcon for "The Healing"
It was the first time for the Star for All Seasons and her 50 years in show business to attend a bloggers conference (blogcon) and she said she had the best time. "Ang lalim naman ng mga tanong. Nahihimay niyo talaga kung ano ang gustong pag usapan ng mga readers niyo. Gusto ko may ganito ulit next time ha! ", the Batangas Governor said as the 2-hour question and answer session held for her latest movie "The Healing" last July 23 at ABS-CBN culminated. "Hindi naman ako techie. Di ko talaga alam what to expect when they say na may bloggers conference. Akala ko sasagot ako ng questions sa internet. Pero may grupo talaga ng bloggers na parang presscon din ang setup. Ang galing! ", Santos enthused. during the blogcon held for her movie "The Healing" at ABS-CBN last July 23. With her are her director Chito Roño and writer Roy Iglesias. 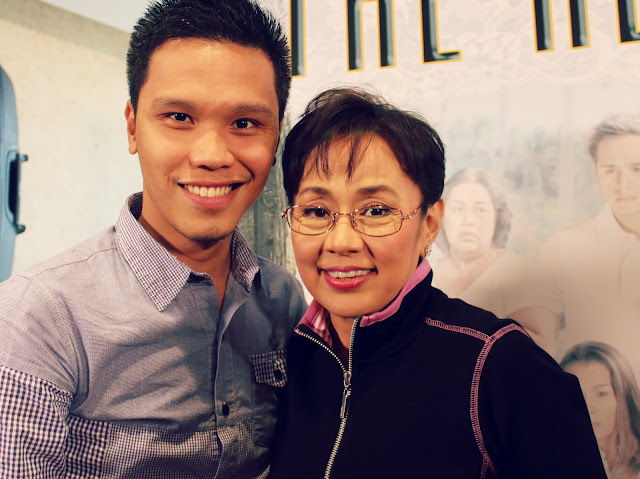 The movies director, Chito Roño, was equally charmed by the level of questions the bloggers also raised for the panel which include Vilma Santos, and the movie's writer Roy Iglesias. "Pahirap ng pahirap ang mga tanong ah", he quipped adding that this is also his first time to attend a bloggers conference to promote a movie. Renowned screenplay writer Roy Iglesias also expressed gratitude. "Ngayon alam ko na kung ano ang kaibahan ng presscon sa blogcon. Mas intellectual ang mga tanong sa blogcon. Ang writer di naman natatanong sa presscon ah. 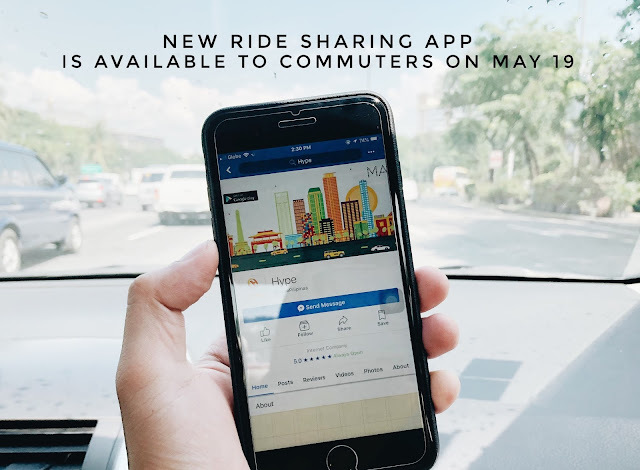 Dito, ang dami kong dapat sagutin. Parang gusto ko ng ganito ulit", Iglesias said. 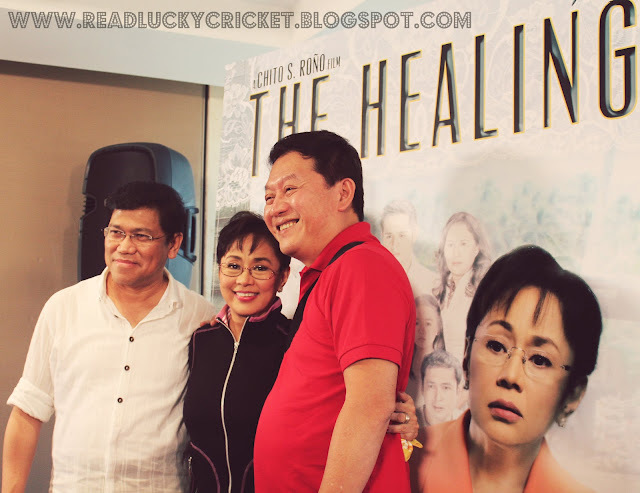 "The Healing" is Star Cinema's latest horror-suspense offering of Star Cinema which will open in more than 100 cinemas nationwide, today, July 25, 2012. Making another headline for this movie, aside from being Vilma Santos's 50th showbiz anniversary performance, is it being the first local film to get two ratings from the MTRCB (Movie and Television Regulatory and Classification Board). The movie is originally given a PG 13 rating but the Director’s Cut was also allowed to be screened in selected malls bearing a PG 18 rating. “This is the first time that this happened and I am happy that mabibigyan natin ang audience ng choice”, Gov. Vilma Santos said.“If medyo matatakutin kayo, you can watch the PG 13. If medyo strong naman kayo, you can watch the Director’s Cut”, the Chito Roño, on the other hand, suggested. There is no specific schedule yet as to which movie houses will show either of the two versions but reports say that some Ayala Malls will screen the Director’s Cut. Being the Batangas Governor for some 6 years now, Santos, meanwhile, shared that “Then Healing” also happens to be her first horror-suspense flick. “Nakagawa nako ng aswang na pelikula dati pero ito talaga yung masasabi mo na suspense-thriller”, the lady Governor shared. 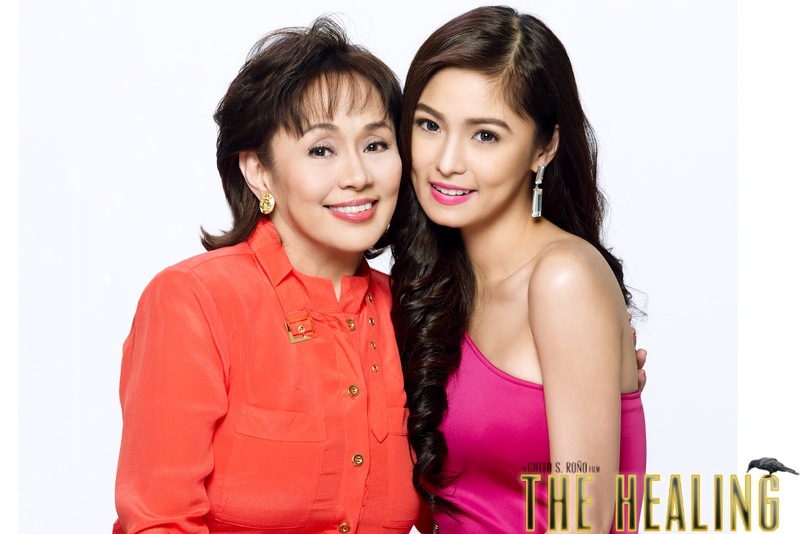 Vilma will be sharing starring credits here with Kim Chiu whom she personally chose for the role. “Wala nakong mahihiling pa kasi ang dami ng chances na ibinigay sakin bilang artista. Yung makatrabaho yung talented younger generation, ‘yun na lang ang gusto kong masubukan”, Santos further said. Other actors gracing the movie are Janice de Belen, Pokwang, Mark Gil, Martin del Rosario, Allan Paule, Cris Villanueva, Daria Ramirez, Ces Quesada, Ynez Veneracion, Simon Ibarra, Joel Torre, Abi Bautista, Mon Confiado and Carmi Martin. All of their characters will revolve around the fictionalized mishaps caused by the “forbidden” faith healing sessions. “There’s no harm in trying faith healing”, the Governor answered when asked if she herself believes in one of the Filipino medical traditions which involves herbs, oils, chants and prayers. The Governor shared that it was a faith healer from Batangas who helped her heal after 3 weeks of hospitalization during her 1st week as Mayor of Lipa City. “It took them (the doctors) awhile before they found out it was irregular bowel syndrome. A faith healer came and prayed over me. Walang masama to try the alternative as long as we also go to the hospital and consult the doctors”, she shared further. 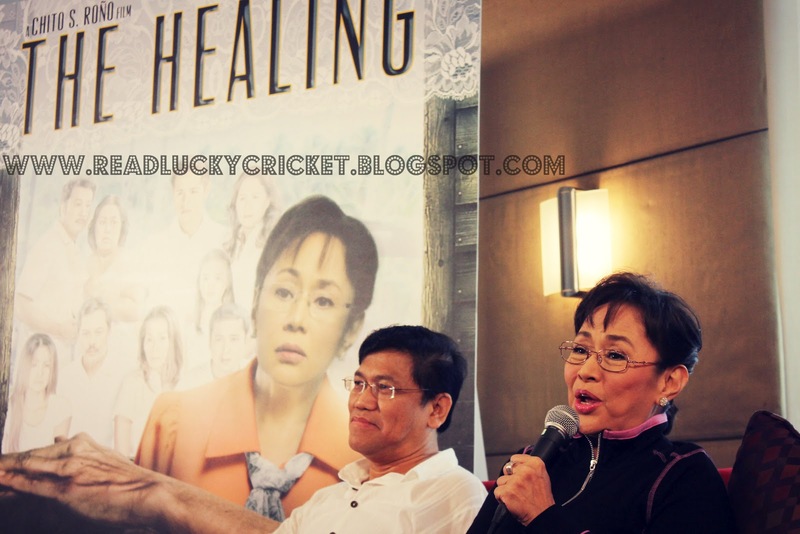 “The Healing” is the latest of the close to 180 movies that Vilma Santos made during her 50 years as an actress and is her first movie in 3 years. Prior to this suspense film, Vilma’s last starring role was for another Star Cinema movie “In My Life” in 2009. “Nilambing ko talaga si Direk na kung sana puwede gawan niya ako ng suspense horror and thankfully, ginawan niya naman ako. Sana magustuhan pa rin ng publiko.”, the Governor enthused. You can watch one of the highlights during the blogcon last July 23 and the "The Healing" trailer below.